Manchego Cheese from Spain for sale. Buy online at Zingerman's Mail Order. Gourmet Gifts. Food Gifts. Living up to its own reputation. Manchego is to Spain what Cheddar is to England: a near legendary cheese, often chosen by both connoisseurs and novices alike. Manchego cheese is made from the milk of Manchega sheep, which graze on the plains of southern central Spain called La Mancha. The name La Mancha is derived from the Arabic word manhsa, meaning land without water. It can get pretty hot in this part of the world, so the fact that Manchega sheep can produce milk under these conditions is quite rare. The Manchegas' milk capacity is quite astounding, especially considering they graze mainly on dry pasture and grain stubble fields. One would think that under these conditions the milk would be low in fats, but quite the opposite is true. Manchega milk is very fatty, which results in a rich, full flavored, fragrant cheese with a subtle, salty, tang on the finish. After years of effort, we've come up with a source for traditionally made, hand crafted Manchego that lives up to its reputation. In Spain, Manchego can be bought at different stages of aging... anywhere from a few months to over a year. 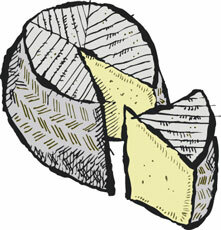 The cheese we have is aged a minimum of six months. Manchego is delicious simply cut into wedges and eaten as is. It's also a plus in the kitchen. You can grate it on to casseroles, soups or salads. It will bring a taste of the Spanish heartland and a swirl of Spain's colorful cuisine to your table. The wheels we're currently cutting into are very creamy, nutty, buttery, and rich—the best I've had in a long time. An excellent sheep's milk cheese.